All mushrooms are good here but I particularly like using shitake and field mushrooms. Use a mixture of the two and cut into an even size, just smaller than a golf ball, they will shrink quite a bit when cooked. Heat a nonstick pan over high heat, Salt and Pepper the steak and fry over high heat for 2.5 minutes on each side, let rest for 5 minutes before serving. Place olive oil in a pan and add shallot, garlic, mushrooms and thyme sauté for 3-4 minutes making sure the mushrooms are cooked. Add in brandy, port and sherry vinegar, reduce by half and add in cream. 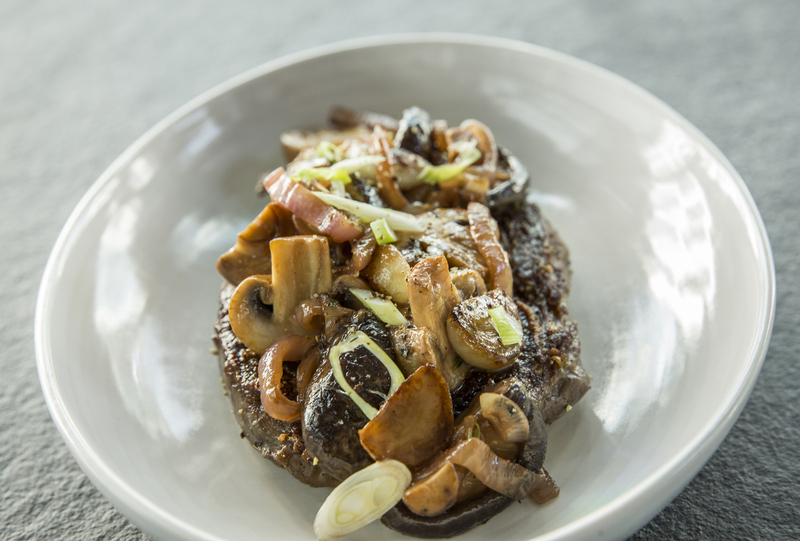 Place the steak on the plate top with mushroom sauce and garnish with spring onion.